Engraving, Anonymous, 8.5 (max.) x 39.2 S.
COLLECTION: New York, 26.50.1 (149) (the upper edge trimmed around the top of the mask; part of the mask missing, filled but not re-drawn). LITERATURE: Carroll, 1987, 234-235, no. 73, with Fig. 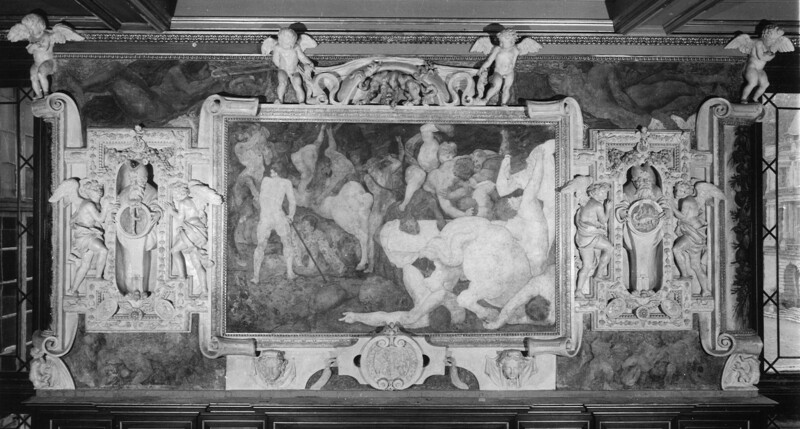 This engraving reproduces in reverse the two painted groups of putti beneath the lateral stuccoes of the wall containing the Combat of Centaurs and Lapiths in the Gallery of Francis I (Fig.P.22, I S a). The mask and drapery and parts of the garlands in the center and the drapery and parts of the garlands at the ends of the print are not found in the gallery. It is most likely that the engraving was based on a drawing or two drawings by Rosso of 1534-1536 that were used for the decoration of the gallery, rather than upon the drawings made by or for the engraver from the frescoes themselves. Such seems to have been the case with all the prints related to the gallery. It is, of course, possible that the direct model for the engraving was a copy of Rosso’s drawing or drawings. Those parts of the engraved image that do not appear in the gallery are probably additions by the printmaker to make one continuous scene out of Rosso’s two and to provide appropriate ends to it. At the Metropolitan Museum of Art, the engraving is attributed to Boyvin. It appears not to be published. The cutting of the lines does not seem to have the regularity characteristic of Boyvin and the stippling also does not suggest his technique. The actual identity of the engraver is still to be determined.